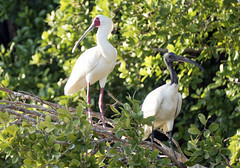 The African spoonbill is widespread across Africa and Madagascar. the African sacred ibis breeds in Sub-Saharan Africa, southeastern Iraq, and formerly in Egypt, where it was venerated and often mummified as a symbol of the god Thoth. The African sacred ibis occurs in marshy wetlands and mud flats, both inland and on the coast.